On June 18, 1920, The Missouri Aeronautical Society, represented by Major Albert Bond Lambert, William and Frank Robertson and a representive of the Flying Club of St Louis leased a 160-acre hayfield on Natural Bridge at Bridgeton Station Road. The eastern end had been a balloon-landing site dubbed Kinloch Field, where Teddy Roosevelt became the first President to ride in a plane at an air meet in 1910. 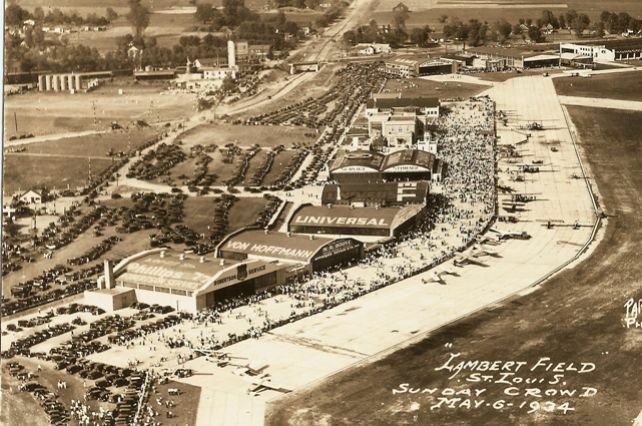 Lambert developed the field at his own expense, then sold it to the city for the price he paid for the land alone. This view shows how the infrastructure first developed on the north side of the field along Route 66.